The legend of the “Fouke Monster,” a Bigfoot-like creature that stalks a rural Texarkana town, is presented as a docudrama using eyewitness accounts and reenactments. When a chilling howl is heard from the woods near Boggy Creek, a little boy named Jim runs to the local store for help from the old men gathered there. However, they only laugh at the boy. Fouke, Arkansas is a small town near Texarkana, populated by farmers, ranchers, fisherman, and hunters. Locals recount tales of the “Fouke Monster,” a Bigfoot-like creature that occasionally wanders into civilization and stalks around farmhouses killing livestock or surprising hunters in the woods. A 13-year-old boy follows dogs on the trail of a deer only to come face-to-face with the creature. He shoots at it, then drops his rifle and retreats in terror. A later search reveals blood and broken branches, but no other sign of the beast. A major search is organized with horses and dogs. One searcher is thrown from his frightened horse after spotting the monster. The search ends when all of the hunting dogs refuse to follow the trail out of fear. For the next eight years, there are no reported sightings of the creature. Travis Crabtree paddles the creek and stops off to meet hermit Herb Jones. Herb discounts the existence of the Fouke Monster. Then the monster suddenly returns to Fouke. A couple comes across the creature while driving a dark road. The beast is next seen stalking and frightening animals at a farm. Farmer O.H. Kennedy finds strange three-toed footprints in a bean field. Bessie Smith and her children search the field and flee in terror when they see the Fouke Monster. Another local sees it while driving at night. Three girls having a bunking party hear its howls outside, grab a rifle, and spend their night in fear. The creature eventually wanders off after breaking flowerpots and overturning everything in sight. It seems to be less cautious and more prone to rampage than ever before. Howard Wallraven hears the beast often outside his mobile home. He also reports that the monster once ripped the hide off one of his dogs. Two young couples, the Turners and the Fords, move into a home together. The men work late at night while the women are home alone. The women hear noises late one night and have their landlord search the property with unsuccessful results. The next day, some visiting family members discover three-toed footprints while fishing. That night, the Fouke Monster terrorizes the family in their home, going so far as to grab at them through a window. The men shoot into the darkness around the home before retrieving the sheriff to help their search. He finds tracks and says that a panther was living under their house. After the sheriff leaves, the monster returns, frightening one man through a window while he sits on the toilet. The men again fire their guns into the night, and one of them, Bobby, is physically attacked by the beast before he runs back to the house for safety and crashes through the door. The Texarkana police mobilize and have Bobby sent to the hospital. Bobby recovers and the Fords and Turners move away. The little boy from the prologue returns as an adult. He wonders if the creature is still out there. The monster’s howl is heard once more before the end credits roll. 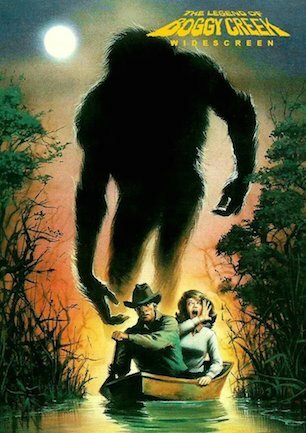 Unless you are of an age that fondly remembers being terrified by the sound of the Fouke Monster’s howl, chances are you will find this film more laughable than frightening. Presented as a docudrama using real eyewitnesses for reenactments, “The Legend of Boggy Creek” offers several accounts of a Sasquatch-esque creature that stalks the country folk of a small Arkansas town. Released in 1972, the film shows every single day of its age. It may have had an impact then, but it does not hold up now. Parents looking for a family-friendly scary movie to watch with their children might be attracted by the PG rating. And what monster-loving child would not want to see a movie about a creature like Bigfoot? Except that in the decades since Boggy Creek was first released, even children’s tastes have grown too sophisticated to find this movie anything other than slow, outdated, and silly. The docudrama approach, unique for its time, gives the film a different look and feel. But it is bogged down, no pun intended, by overlong filler scenes of various wildlife and landscapes. Gaps between monster sightings are padded with extended sequences of townspeople laboriously going about their daily lives or of animals drifting lazily down a creek. When the monster does show up, it either disappears quickly or does little of note. One time, the Fouke Monster is shown thrusting its arm into an open window. Another time it even has a physical struggle with a man. Those two scenes cover most of the action. Locals may tell stories about it killing animals, but usually all we ever see is a shambling shape in the woods accompanied by an occasional howl. The musical score is strangely upbeat, and features instrumental pieces that would not be out of place in an episode of “Leave It to Beaver.” The two original songs (yes, original songs) are even more bizarre. Birds and beast and wind and water. No man smoke blinds the eagle’s eye. Feed and breed and live and die. Rising when the storm cloud blows. Safe within a world he knows. There is no other such as I. To listen to my lonely cry. This is a creature that is supposed to invoke fear. A terrible monster that torments families in their homes and ravages animals. Yet this saccharin-sweet theme depicts the beast as a poor, pitiful soul contemplating a lonely existence while trapped in a world where love is unfamiliar. Imagine “Texas Chainsaw Massacre” having a similar leitmotif for Leatherface. Wait a minute for me. And nobody sees the flowers bloom but me. Lo, ain’t it great to be free? “The Legend of Boggy Creek” is for nostalgia buffs only. There are fans out there that hold Boggy Creek in high regard, but that regard is colored by childhood memories that remember something as better than it was. No matter the person’s age, anyone seeing this movie for the first time in the 21st century will only be confused or amused, and anything other than satisfied or scared.